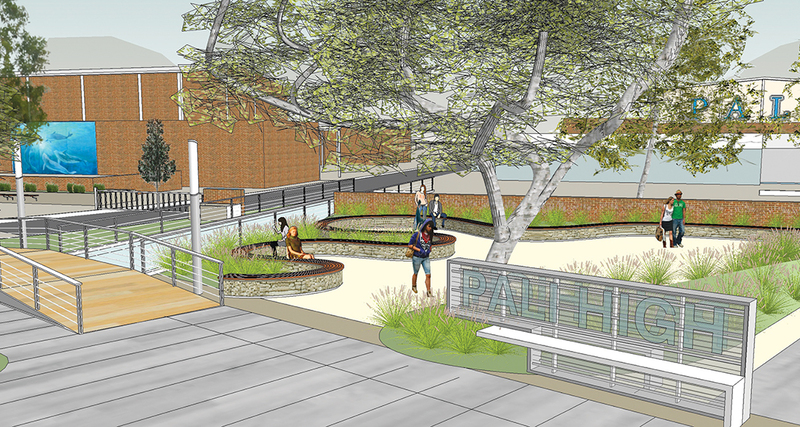 A project to increase safety and beautify the entrance to Palisades Charter High School has entered its final phase of fundraising. Thus far, the estimated $718,000 Gateway project has garnered $100,000 toward its goal, including a recent $25,000 gift from local real estate entrepreneur Jordan Kaplan, a 1979 PaliHi graduate. Kaplan, the project’s largest donor and the CEO of the realty company Douglas Emmett, chose to contribute after seeing the plans and noting their current progress, which during the previous two phases installed gardens, benches, a dolphin statue commemorating longtime teacher Rose Gilbert, citrus trees and historical artwork. Internationally-known architect Doug Suisman has designed an entrance to Palisades High School, at the corner of Bowdoin Street ￼and Temescal Canyon Road, closer to the original architect’s 1960 vision. 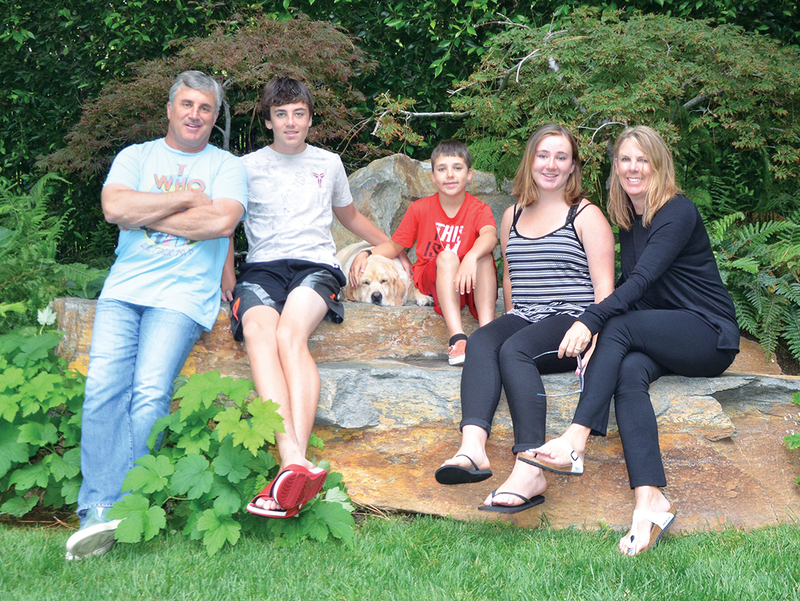 His son Skyler, 14, will enter Pali as a freshman in August, and Kaplan and his wife, Christine, have two other children: Claire, 15, who attends Windward School, and Jace, 10, a student at UCLA Lab School. The Pali Gateway Project committee includes two other 1979 PaliHi grads, Cheryl Kelton) Clark and Sheri (Redke) Sharp, plus Rachel Galper (whose husband Steve is a ‘79 grad), Ivy Greene, Pam Mann and Susie Newman. If the project can solicit an additional $50,000 by September 1, then the PaliHi booster club will match that money, which would mean that the committee could begin ordering the engineering and construction documents plus permits, which are estimated to cost about $190,000, Clark said. The online donation site is: www.gofundme.com/Paligateway. The remaining estimated costs of the project include $80,000 for site preparation; $192,000 for a garden with seating, a serpentine wall, storage and a sign; plus $256,000 for a pedestrian bridge, raised crosswalk and lighting. The result will beautify the entrance while also widening access for students, who will no longer need to spill into the street to get to school. Jordan, Skylar, Jace, Claire and Christine Kaplan are supporting the Gateway Project, a much needed safety and beautification effort at the entry to Palisades High School. Both Clark and Kaplan are hoping that his donation will inspire other major donors. Kaplan has made philanthropy one focus in his life. He has given to many local causes, including the parade and baseball fields, and he is on the board of various organizations, including the UCLA Foundation, St. John’s Health Center, and Sound Mind Sound Body, a UCLA charity dedicated to fighting childhood obesity. In addition, Kaplan, who earned an M.B.A. from UCLA in 1986, sometimes holds benefits at his home, including a recent one for UCLA autism treatment and teen cancer, which raised $3.2 million and featured a concert by The Who, Joan Jett and Eddie Vedder. Thus far, the Pali Gateway Project has received various other donations, including $3,000 from the Lions Club, a couple of $5,000 donations, four $2,500 donations, one $1,500 donation, and a dozen $1,000 contributions, including one from realtor Anthony Marguleas of Amalfi Estates, who suggested that the project reach out to local realtors with a challenge of raising $10,000 from each company, Clark said. Although that goal hasn’t been reached, realtors have been supporting the project. K.C. Soll of Sotheby’s Real Estate has offered to donate 5 percent of her commission from upcoming sales in the Palisades to the Gateway Project. Coldwell Banker also raised funds through its Fourth of July event, which offers free massages, free pony rides and free popcorn before the parade plus the sale of Masha Archer jewelry, which ranges in price from $500 to $10,000. All of the realty company’s proceeds will go to the Gateway Project.